See our available courses for the public and professionals, then register or inquire about scheduling. We're looking forward to hearing from you! The moment you meet your instructor, you'll feel like you could trust him or her with your life. Who better to teach you how to save a life? Our instructors are experienced EMTs and veteran safety experts with thousands of hours in classrooms, on ambulances and in hospital emergency rooms. They are also moms, dads, blue collar and white collar, everyday people who value human life. CPR in School: Now it's the Law! A new generation of lifesavers in New Jersey has been made possible by two laws that took effect in 2014. Janet's Law requires an automated external defibrillator (AED) and AED/CPR trained personnel to be at all public and non-public schools and be easily accessible during school-sponsored sporting events and practices. 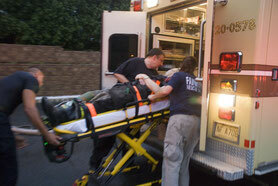 A second law requires all high school students to receive CPR/AED instruction. 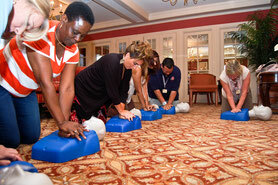 REGISTER NOW FOR OUR CPR/AED CLASSES. WE'LL COME TO YOUR SCHOOL!